The summer is practically over already! Where in the world did it go? School is starting back up again, and even if we’re not in school anymore, this time of the year gives us the feeling that we should be preparing our supplies and setting up desks. We’re all getting set up to knuckle down and do our work. The pleasantness and productivity of your working hours are largely affected by where you spend them. If a room is cluttered and distracting (or just plain ugly), you will probably get a lot less done. However, if you’re working in a clean, tidy, nicely decorated and painted room, it will have quite the opposite affect. 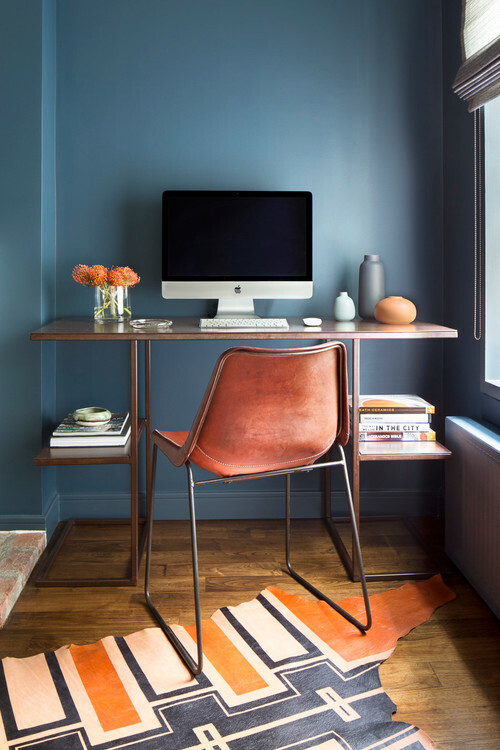 So how do you choose the paint colors you want in your home office? It depends on what effect you’re going for, but here are some general tips. Sometimes it can be so hard to concentrate on a task. Everything is still and quiet, but then the neighbor’s lawn mower starts up, or a fly starts buzzing. It’s just that one thing, but it’s so distracting! During those times when our concentration needs all the help it can get, certain paint colors can give us that extra boost! If distraction is the problem in your home office, you might want to paint it a nice shade of blue or green, very calming colors that can help us focus. You can use an energetic shade of blue or green and still have that soothing atmosphere; don’t choose a tone that will make you start yawning! If you feel like you need some excitement in your work, like you need to expand your mind with creative thinking, or just want to do something different, consider purple or yellow paint in your home office. These colors, along with vibrant green, tend to promote creative thought and stimulate your imagination. There are no rules about what color you can or can’t paint your home office, but it would probably be much better if you avoided red and orange. These are very nice colors, but for a work space they can be stressful. Red might make us think of a teacher marking an essay with a red pen, or of a stop sign. Orange reminds us of construction zones and caution signs. If you would like to paint your office a bright color, but you don’t really want all four walls painted that shade, remember that accent walls are a great option. You could just paint the wall over your desk that bright shade and paint the rest of the walls something a little more mellow. Also, if a room is cluttered, not only do papers tend to get lost much more easily, but it is also distracting -- sometimes very distracting! However, if you keep your desk and study orderly, it will help a lot. Finally, we’ve given some tips on what colors might be good for your home office, but it’s really up to you! Each person has different tastes and work patterns, so their offices will naturally look different. Choose a color you like; you can always repaint! If you need your home office painted (or any other room in your house), Southington Painting would be happy to help you! We offer a wide variety of services, including wallpaper services, drywall services, kitchen cabinet painting, deck maintenance, exterior and interior painting. Based in Plantsville, Connecticut, we have been working with this area since 1979; how can we serve you today? Click here for a free estimate!